Piracy has become ubiquitous in the world of PC gaming, even as developers and publishers play around with DRM (to varying degrees of success) in an attempt to stop it. So when Patrick and Daniel Klug, the two-man team behind Greenheart Games, released Game Dev Tycoon to to the world yesterday, they were proactive. Minutes after making the game available for purchase, the developers uploaded their own cracked copy to a file sharing website and waited for the inevitable. That was yesterday; today, more than 9 out of 10 people playing Game Dev Tycoon are playing a pirated copy. But how do the pirates like it when the tables are turned? As the title suggests, Game Dev Tycoon is a business simulation game that allows players to “replay the history of the gaming industry by starting your own video game development company in the 80s. Create best selling games. Research new technologies and invent new game types. Become the leader of the market and gain worldwide fans”. In the process, they’ll have to contend with changing technology and, among other challenges, piracy. 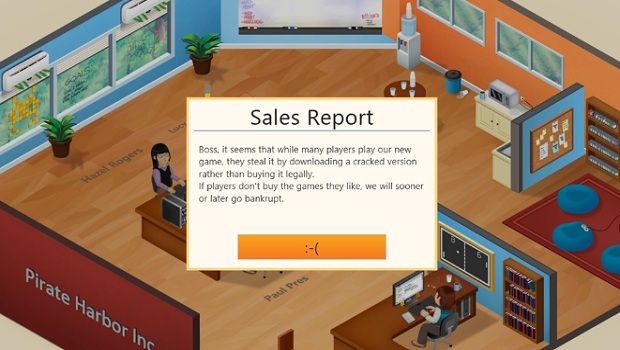 Game Dev Tycoon is DRM-free and affordable at only $7.99. A purchase nets you PC, Mac, and Linux versions, the ability to install it to up to three devices for personal use, a Steam key when/if Game Dev Tycoon is Greenlit, and the warm fuzzy feeling of helping out a small indie start-up. Really, why wouldn’t you buy it? You can read the full explanation of events at the Greenheart Games blog here, and you can buy the game or try the free demo here.